Wheat plantlets regenerated from tissue culture and genetic management are normally very weak and need to be strengthened and propagated so that they can be transplanted. If the regenerants do not survive after transplant,the genetic management means uselessness in wheat improvement. Zhu et al. reported that using N6  base medium supplemented with IAA 10 mg/L and sugar 80 g/L to propagate unpollinated-ovary-derived haploid plantlets did not induce clonal variations. Li et al. reported that for Triticum aestivum x Haynaldia villosa hybrid plantlets,the above medium was very efficient for rooting and strengthening. When we used this medium to propagate the anther-derived haploid plantlets of wheat for 3-4 subcultures,the growth was slowed down and the rooting was inhibited. Medium is a key factor in plantlets propagation,strengthening and rooting,while research concerning the medium for wheat plantlet propagation is very poor. 76 newly regenerated green plantlets from anther culture of wheat were used in this study because they were very slim. The plantlets were randomly divided into 3 groups and cultured on MS ,1/2 MS (but the KH2PO4 remained unreduced) and N6 media to compare the effects of basic medium for the growth of the regenerated plantlets. Then some macro and micro elements from the medium which showed better effects through above comparative study were optimized to form a medium for propagating wheat regenerated plantlets. When propagating the plantlets,all the underground parts and 1 cm above the meristem of overground parts were cut off,and then the tillers were separated from the tillering node. One to two tillers were transplanted to a test-tube (f30 mm,150 mm) containing 40 mm (in height) medium every month. To check the growth of the plantlets,the fresh weight (FW) of all the overground part of the plantlets was measured before the next subculture,then the dry weight (DW) was measured after the overground part was dried at 103 °C for 2 hr. The weight of the underground part was not measured because it usually contained agar and was difficult to separate the root from the gel. All media were supplemented with 10 mg/L IAA,80 g/L sugar,6 g/L agar,pH 5.8. The regenerants were cultured at 25 ± 2°C,16 h light (1500 Lux) / 8 h dark of photoperiod. One month later,the plantlets grown on the N6 medium were obviously better than those grown on other two media. Plantlets on N6 medium were about 6 cm in height and were very healthy. Plantlets on MS medium were about 3-4 cm in height. Heights of those grown on 1/2 MS medium were in the middle. These results were similar to those reported by Zhu et al. and might result from the nitrogen composition of the media. The NH4+ concentration of MS medium was about 3 times of that of N6 medium. High concentration of NH4+ might be harmful to the plantlets . So the following research was based on the same nitrogen composition as N6 medium. To reduce the cost of micropropagation,the organic ingredients of N6 medium were not added except 0.5 mg/L of thiamine. The plantlets grown on this medium did not show any difference to those on N6 medium. After 3 times propagation on the modified N6 medium mentioned above,the growth of some plantlets slowed down. Some calcium deficiency symptoms,for example the necrosis of the root-tips,appeared. Increasing CaCl2H2O concentration did not relieve the symptoms,but caused Cl- poisoning showing withered leaf tip. We used 1.0,2.0,3.0,4.0,5.0,and 6.0 mM Ca(NO3)24H2O instead of CaCl2H2O,and added 40 mg/L (approx. 0.5 mM) of KCl to supply Cl,reduced KNO3 content to adjust the nitrogen composition to the level of N6 medium to test the effects of Ca(NO3)2 on relieving the calcium deficiency symptoms. The optimal rooting was achieved with 2.0 and 3.0 mM Ca(NO3)2,So 2.5 mM (590 mg/L) of Ca(NO3)24H2O was chosen as the best concentration. N6 medium was originally designed for anther culture of rice,and it does not contain Cu and Mo. 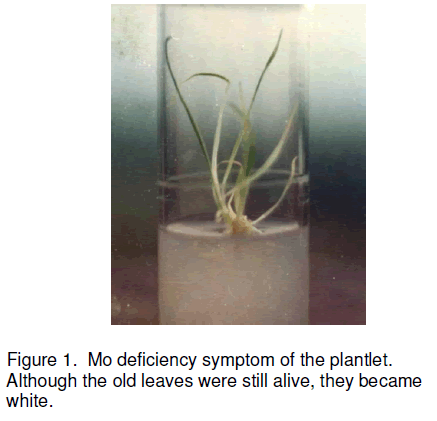 If the plantlets propagated on the medium for a long time,Cu and Mo deficiency symptoms appeared (Figure 1). Addition of Mo alone to the medium did not increase the FW and DW of the plantlets,although the leaves became very green. This may result from the heterotrophic nutrition of the regenerants when they grown on the propagation medium. Although Mo did not increase the FW and DW,synergetic effects of Cu and Mo on the growth of the plantlets were observed. When adding 0.025 mg/L (0.1 mM) CuSO45H2O and 0.25 mg/L (1 mM) Na2MoO42H2O to the medium,the plantlets became much healthier. Compared to those grown on the N6 medium,the average FW and DW were 42% and 39% higher when the two elements were added,and those were only 8.8% and 20.9% higher when only CuSO45H2O was added to the medium. Mo is essential for the nitratase,so it affects the nitrogen metabolism. Cu has many functions in plant,and also affects the protein and carbohydrate metabolism. When Mo and Cu were added to the medium together,the C metabolism and N metabolism would be concordant. This may result in the synergetic effects . Figure 1. Mo deficiency symptom of the plantlet. Although the old leaves were still alive, they became white. The deficiency symptoms,especially those of micronutrients were easily observed in our experiments might result from the materials we used. The anther culture derived plantlet was originated from single pollen,so the stock of micronutrients was very poor. When the plantlet was propagated on the nutrients lacking medium,the symptoms might appear. Although Cu is an essential mineral element,Cu2+ is also a toxic ion. So we studied effects of different concentrations and different forms of Cu-nutrition on the growth of the plantlets. Compared to CuSO45H2O,chelated form of Cu-EDTA was better because it had less toxic effects. For example,when 0.8 mM (0.2 mg/L) of CuSO45H2O was added to the medium,rooting of the plantlets was slightly inhibited,while the plantlets rooted well when 0.8 mM (Figure 2 ) or even 2.0 mM Cu-EDTA was added to the medium and grown vigorously. Figure 2. Effects of 0.8 mM Cu-EDTA on the growth and rooting of the plants. The components of the medium were gradually optimized during a long period of propagation by carefully observing the deficiency symptoms and toxic effects,and eventually formed a new medium (M10 medium) that was suitable for the propagation of regenerated plantlets of wheat. 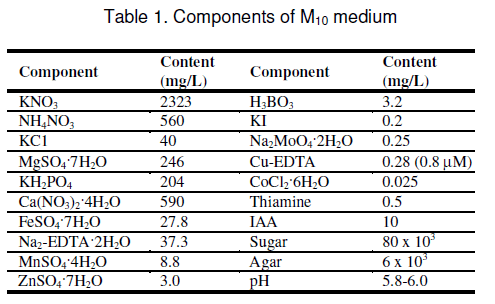 The ingredients of the new medium are showed in Table 1. The M10 medium was very powerful for rooting,propagation,and strengthening culture of wheatregenerated plantlets. The plantlets were very healthy when grown on this medium. After onemonth culture on the medium,3 to 7 tillers were formed from one tiller inoculated. Although propagation efficiency differs among different varieties,theoretically,one plantlet would produce 312 - 712 new plantlets after one year propagation on this medium. Generally,the plantlets rooted very well 2 weeks later on the medium,and were ready for transplanting to field. The best stage for transplant was when the length of roots is about 1-2 cm. We normally transplanted the plantlets directly to field after 3 days hardening treatments by open the cover of the test-tube,and put them out door. More than 10,000 plantlets regenerated from various tissue cultures including anther culture and protoplast culture were directly transplanted to field without any special management except watering. The total survive rate of transplant was about 98%. M10 medium contains appropriate proportion of NO3 -N and NH4+-N,and balanced,full-valence mineral nutrients. The poison effects of NH4+-N,Cl- and Cu2+ are minimized. All these may explain healthy growth of the plantlets. This project was sponsored by the Opening Projects of National Key Laboratory of Crop Genetic Improvement and the Key Projects of Educational Committee of Hubei Province (97A26),P. R. China. Zhu Z.,Wu H. and Qiao Y. (1987) Unpollinated ovary culture of wheat and the reservation and multiplication of the clone of its haploid plant. Hereditas (Beijing),9(1):44. Chu C.C.,Wang C.C.,Sun C.S.,et al. (1975) Establishment of an efficient medium for anther culture of rice through comparative experiments on the nitrogen sources. Scientia Sinica,18:659- 668. Li J.,Yang Z.,Tian H.,et al. (1991) Somatic cell clone establishment and amphiploid synthesis of Triticum aestivum x Haynaldia villosa intergeneric hybrid. Hereditas (Beijing),13(1):1-3. Murashige T. and Skoog F. (1962) A revised medium for rapid growth and bioassays with tobacco tissue culture. Physiol. Plant 15:473- 497. Mengel K. and Kirkby E.A. (1982) Principles of plant nutrition (3rd Edition). International Potash Institute,Bern,Switzerland.